Which FINS are best for you? You will often hear that the full pocket or full foot fin is for snorkelers and open heel fins are for divers. You will also hear contradictions that say that the open heel is for cold water diving and the full foot is for tropical water diving. Like anything else, there are variations. More popular, even in warm water diving locations. 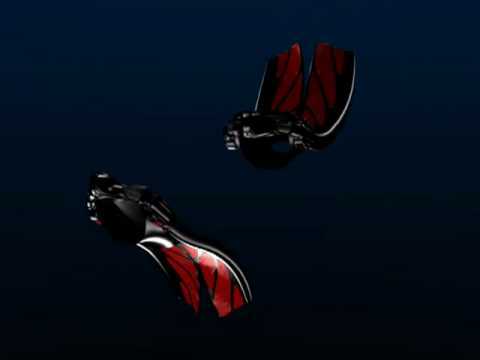 In Sydney open helled fins with boots are used by everone who scuba dives on a regular basis. The open heel is designed like a slipper with a strap. The foot slides into a pocket and a strap goes over the heel, holding the fin in place. This type of fin is worn with booties made of neoprene. While the foot pocket must still be a good fit, the compression of the neoprene in the boot means that the fit is not as critical as with the full foot design. You can change the thickness of your boots if you are diving in waters of different temperatures but many divers still prefer the extra protection the booties give over the bare foot. The full foot fin, when properly fitted, allows for a more efficient transfer of power from the legs to the fin. A poor fit can lead to blisters and you could even lose your fin along the way. Additionally, the full foot fin is not recommended for cold water diving because your bare foot would be exposed. There are, basically, two fin blade styles: the paddle and the split fin. In recent years, some fin manufacturers included a subclass of the paddle as a modified paddle. 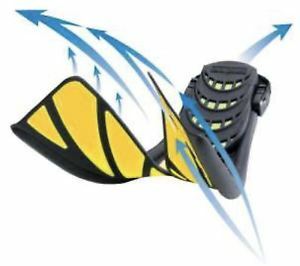 The split fin is a design that is relatively new, and many divers swear they are the best that happened to humankind since the invention of light. The blade is very flexible and is split down the centre. As you move the fin through the water, it acts more like a propeller than a paddle. The flexibility of the fins creates a stream of water like the vortex of a propeller or the force of a jet. Split fins are 80% more efficient than blade fins and this results in a 30+% improvement in air consumption and bottom time. The paddle fin is the most common style of blades and, at first glance, is the same as they were 50 years ago. While the materials have changed and small design changes have resulted in remarkably improved efficiency, the blade is a solid piece that connects back to the foot pocket. The paddle design works to propel you through the water on a fin that is relatively inflexible or stiff. The stiffer the fin, the more effort that is needed to get started. While they do require the most muscle, they provide good power. For frog kicking used by technical divers (to minimise silting), blade fins are the only real option as split fins cannot frog kick effently and also run the risk of entanglement if a line is being used. Modified paddles do not have the blade extending the full width back to the foot pocket. Different designs have cut-outs close to the foot that reduce effort on the upward kick. Using various materials over the different areas of the fin allows a more flexible fin that is more efficient.